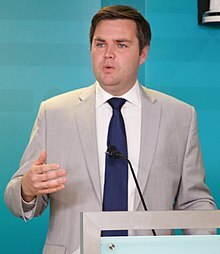 James David "J. D." Vance (born James Donald Bowman; August 2, 1984) is an American author and venture capitalist known for his memoir Hillbilly Elegy. The book is about the Appalachian values of his upbringing and their relation to the social problems of his hometown. The book was on The New York Times Best Seller list in 2016 and 2017. It was a finalist for the 2017 Dayton Literary Peace Prize. It attracted significant attention during the 2016 election from national media as a window into the white working class. Vance attracted criticism from some Eastern Kentuckians who said he was "not a hillbilly", while others supported him. James David Vance was born in August 1984 in Middletown, Ohio, as James Donald Bowman, the son of Donald Bowman and Bev Vance. Vance's only sister, Lindsay, was born when his mother was nineteen years old. His mother and father divorced when Vance was a toddler. Not long after, Vance was adopted by his mother's third husband. Vance's mother struggled with prescription pain medication which led to a heroin addiction throughout his childhood. She left behind a string of husbands and offered little stability. As a result Vance and his sister were raised primarily by his grandparents. Vance was educated at Middletown High School, a public high school in his home town. After graduating from high school, he enlisted in the United States Marine Corps and served in Iraq performing public affairs activities. Vance later received a B.A. degree from Ohio State University in Columbus, Ohio. While he was at Ohio State, he worked for Republican state senator Bob Schuler. After graduating from Ohio State, Vance received a J.D. degree from Yale Law School. During his first year at Yale, his mentor and professor Amy Chua convinced him to write his memoir. After law school, Vance worked as the principal in a venture capital firm owned by Peter Thiel, known as Mithril Capital Management, LLC. In December 2016, Vance indicated that he planned to move to Ohio to start a nonprofit and potentially run for office and work on drug addiction. The non-profit is called Our Ohio Renewal. In January 2017, Vance became a CNN Contributor. In April 2017, Ron Howard signed on to direct a movie based on Hillbilly Elegy. In early 2018, Vance was reported to have been considering a bid for U.S. Senate as a Republican. Vance is married to one of his former law school classmates, Usha Chilukuri, an Indian-American woman who was a law clerk to Supreme Court Chief Justice John Roberts during the 2017–2018 Term. The couple has one son, Ewan. Vance, J. D. (June 2016). Hillbilly Elegy: A Memoir of a Family and Culture in Crisis. Harper Press. ISBN 9780062300546. Wikimedia Commons has media related to J. D. Vance. ^ a b Heller, Karen. "'Hillbilly Elegy' made J.D. Vance the voice of the Rust Belt. But does he want that job?". The Washington Post. Retrieved July 27, 2017. ^ "Summary - Hillbilly Elegy: By James David Vance - A Memoir of a Family and Culture in Crisis". GoodReads.com. Retrieved May 10, 2017. ^ a b Heller, Karen. "'Hillbilly Elegy' made J.D. Vance the voice of the Rust Belt. But does he want that job?". The Washington Post. ^ a b c "Hillbilly Elegy: A Memoir of a Family and Culture in Crisis". Enotes.com. Retrieved May 10, 2017. ^ Rothman, Joshua. "The Lives of Poor White People". The New Yorker. Retrieved March 6, 2017. ^ SENIOR, JENNIFER. "Review: In 'Hillbilly Elegy,' a Tough Love Analysis of the Poor Who Back Trump". The New York Times. Retrieved March 6, 2017. ^ Kiser, Brandon. "Author too removed from culture he criticizes". Lexington Herald-Leader. Retrieved March 6, 2017. ^ Miles, StefanieRose. "Author J.D. Vance does have hillbilly cred — like it or not". Lexington Herald Leader. Retrieved March 6, 2017. ^ "Hillbilly Elegy by JD Vance review – does this memoir really explain Trump's victory?". The Guardian. December 7, 2016. ^ "The Lives of Poor White People". The New Yorker. September 12, 2016. ^ "'Hillbilly Elegy' Recalls A Childhood Where Poverty Was 'The Family Tradition'". NPR. August 17, 2016. ^ Michael D. Clark (March 10, 2017). "Middletown native J.D. Vance's book started with simple question". JournalNews.com. Retrieved May 10, 2017. ^ "Former Marine J.D. Vance's 'Hillbilly Elegy' Will Be Made into a Movie". Military.com. Retrieved July 27, 2017. ^ "J.D. Vance to Speak About Memoir Hillbilly Elegy Feb. 2". Yale Law School. January 27, 2017. Retrieved May 10, 2017. ^ Vance, J. D. (2017). Hillbilly Elegy. London, U.K.: William Collins. p. 181. ISBN 9780008220563. OCLC 965479512. I took a job at the Ohio Statehouse, working for a remarkably kind senator from the Cincinnati area named Bob Schuler. He was a good man, and I liked his politics, so when constituents called and complained, I tried to explain his positions. ^ "How the 'Tiger Mom' Convinced the Author of Hillbilly Elegy to Write His Story". The Atlantic. June 7, 2016. ^ Sarah McBride (January 20, 2017). "Peter Thiel's Mithril Capital Raises $850 Million VC Fund". Bloomberg Technology. Retrieved May 10, 2017. ^ Hohmann, James. "The Daily 202: Why the author of 'Hillbilly Elegy' is moving home to Ohio". The Washington Post. ^ A. J. Katz (January 17, 2017). "CNN Strengthens its Roster of Commentators and Contributors". AdWeek.com. Retrieved April 27, 2017. ^ Reed, Ryan. "Ron Howard to Direct, Produce 'Hillbilly Elegy' Movie". RollingStone. Retrieved April 12, 2017. ^ Gomez, Henry. "J.D. Vance Is Now Seriously Considering Running For Senate In Ohio". Buzzfeed. Retrieved January 11, 2018.